Materials: Minky, wire, pipe cleaners, embroidery thread, felt, beads, magnets. 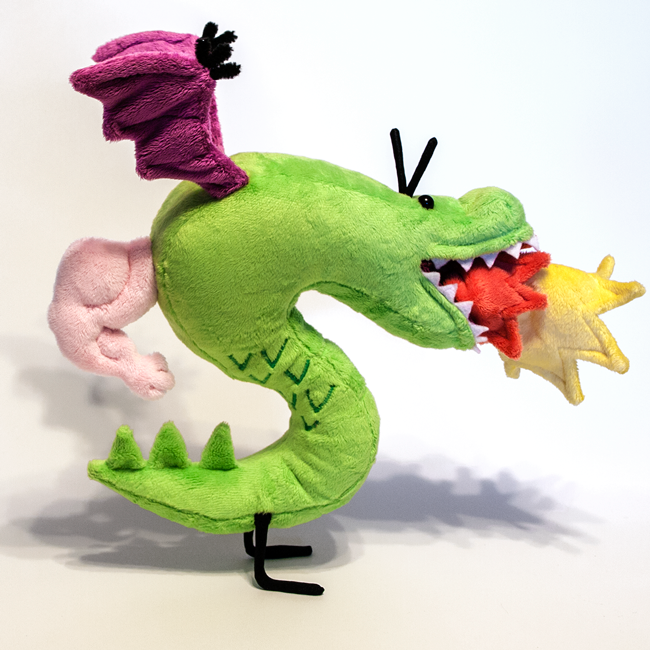 A plushie of Trogdor the Burninator, the wing-a-ling dragon created by Strong Bad in the flash web-series Homestar Runner. The plushie is made from minky for a soft, cuddly touch and bubbly look. Lined with interfacing for structural strength and filled with high quality stuffing. A heavy wire is used for the legs to support the weight of the body (wrapped with yarn to protect from being sharp, and covered in spandex for a clean finish). He can stand upright and balance on his own, with and without the flame, but he is a little wobbly so leaning him against something will help make sure he doesn't fall off balance. The wings are reinforced with interfacing and a pipe cleaner armature, which is also used for the claws and angry eyebrows. The eyes are black beads, stitched in place. The scales are embroidered. The teeth made of heavy felt. The mouth has a magnet sewn into the top and bottom pallet, and the conical flame also has two magnets stitched inside of it to be optionally attachable. Trogdor comes in two color variants and scale patterns, this one being the bright and neon "MS Paint" palette of lime green with magenta wing-a-lings. I have also made him in darker colors of kelly green and purple wing-a-lings to match his more "mature" look from Telltale's video game "Strong Bad's Cool Game For Attractive People".